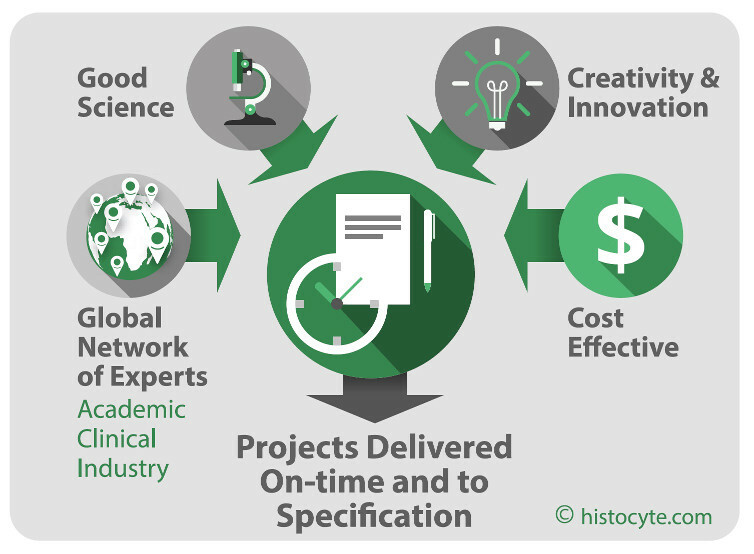 HistoCyte Laboratories Ltd offer a variety of contract services, from custom cell line development through to biomarker assessment. With sound science and creative minds we can deliver high-quality projects in a cost-effective and timely manner. By employing our network of experts we can provide you with the best solutions to your needs. HistoCyte Laboratories Ltd has an extensive network of pathologists, scientists and organizations in clinical and biotech laboratories. Our in-house capabilities, along with our network, allow us to rapidly assess the utility of potential assays. Through our in-house resources and reliable network we can optimise and assess your technology. Whether you have an antibody, probe or require evaluation of samples such as cells or xenografts, we can perform the assessments and have them reviewed by expert pathologists.